If you were thinking about going out for lunch or dinner tomorrow, you should consider going to Outback Steakhouse! Tomorrow only, 1/2/18, Outback will be offering customers a FREE Bloomin’ Onion appetizer! To get the freebie, all you need to do is say “Outback Bowl”” to your server (no coupon necessary!). 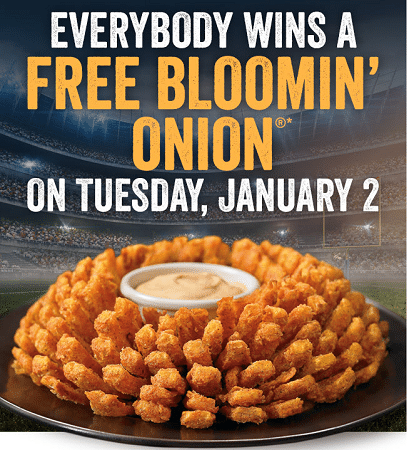 Offer valid for a complimentary Bloomin’ Onion appetizer while supplies last. Say “Outback Bowl” to your server to receive the offer. Limit one complimentary appetizer per table/per check. Offer valid at participating Outback Steakhouse restaurants on 1/2/2018 for lunch or dinner (dine-in only). Offer is not valid in conjunction with any other discount, coupon or offer and has no cash value. Prices, product participation and restaurant hours may vary by location. Void where prohibited by law. Valid 1/2/2018 only.